Looking for a party idea that is as unique as it is fun? You need a Sumo Wrestling party. Drop a couple of kids in Sumo suits and turn them loose! They’ll have a blast trying to waddle around in the over-sized Sumo suits trying to knock each other over. 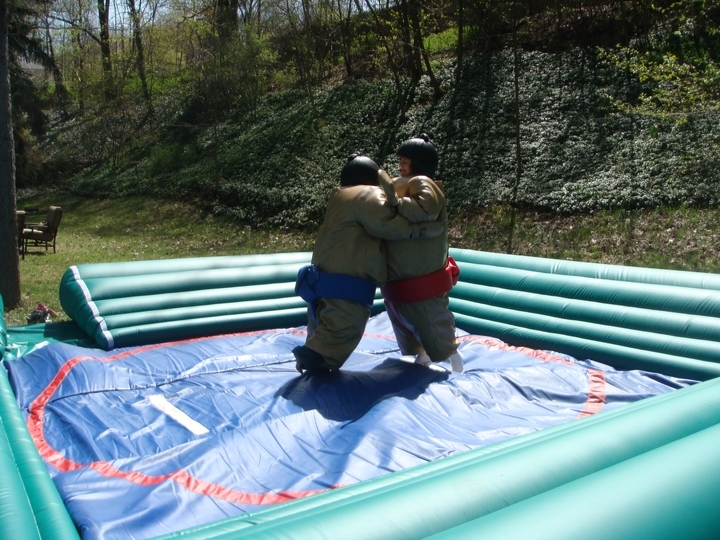 Sumo Wrestling parties are great for teens and older. Even those that are not inclined to participate will never forget the time they got watch their friends and family romp around in Sumo suits. There’s nothing more comical than watching your friends bumping into each other in their Sumo suits. Just make sure you have your camera ready because this will be a moment you will not want to forget! Now you just can’t pick up Sumo Wrestling sets at your local party store. They can also be quite expensive, so instead of buying them, check with a local party rental company. You’ll also want to make sure that the company you are renting from uses all the safety devices available to them so that your party ends as great as it starts.